Laundries tend to be one of the few spaces in your home that doesn’t get a lot of thought. 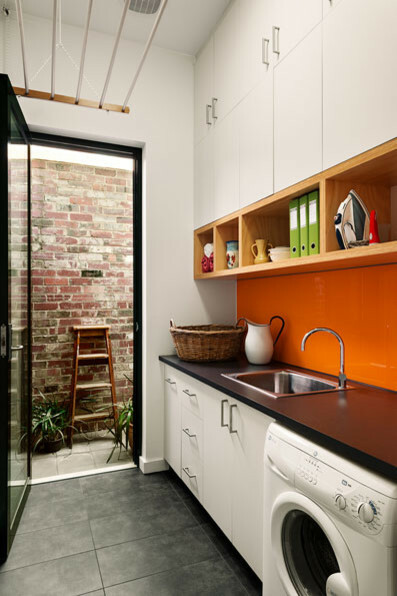 However a neglected laundry room can be transformed into an enjoyable space with a little planning that focuses on functionality and eye-catching interiors. 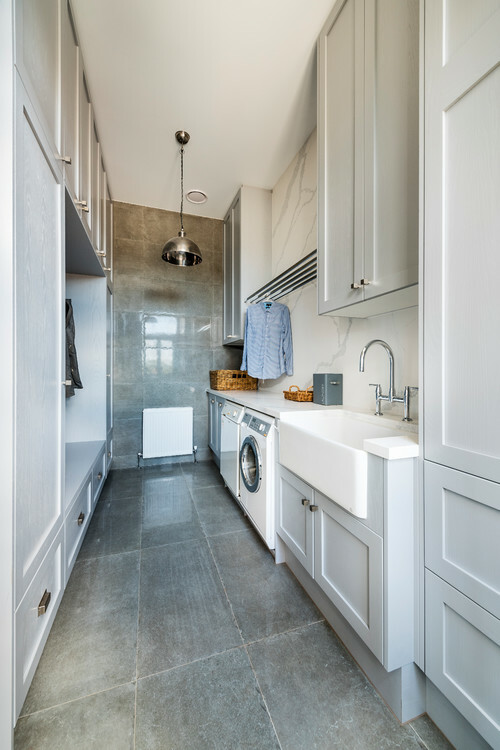 So if a laundry renovation is something you’ve been thinking about, either because it’s old and run down, or because the room isn’t well utilised, you’re going to love our 7 tips for planning your laundry renovation. The first step to remodelling your laundry is deciding on the location of your laundry space. Simpler access from your laundry to the backyard makes it convenient to hang clothes on the line rather than just popping them in the dryer, saving money, energy and wear and tear on your clothes. If you’re trying to reduce your environmental footprint, having the laundry with outdoor access makes diverting grey water to use on the garden a lot easier. By locating your laundry with outdoor access you get the huge bonus of opening the back door and allowing the breeze to draw out the excess moisture from washing and drying clothes, thereby reducing potential mould and smell issues. If you don’t have the option of locating your laundry with outside access, you need to think about how to improve ventilation to tackle the excess humidity generated from the room, especially if it doubles up as a bathroom. The excess of moisture in a laundry can cause damage that is costly to repair, not to mention the health issues that can arise when you’re dealing with mould. When you are planning for the space, make sure there are opportunities for ventilation by including a window, or if this is not possible, by installing a ceiling fan or some method of air conditioning. By improving ventilation in the room, you are also improving the safety for its residents by reducing the fumes from cleaning products that often have their home in the laundry. We’ve all experienced the frustration of a cluttered laundry. 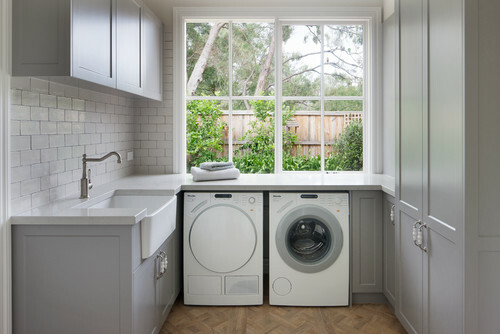 To experience a fully-functional space, the process for designing a laundry that successfully meets your lifestyle requirements shouldn’t be rushed. It pays to do your research and spend a little extra time planning to ensure your laundry has sufficient space to hold items like a washer and dryer, sink, countertop space, storage, laundry baskets and still has enough room to move around and complete tasks. To get the dimensions of your laundry right, you will need to consider the type and size of the washer and dryer. Do you intend on using a top or front loading model? If it is a front loading model, which way does the door open? The answers to these questions will dictate the ease of access and placement of your machines. 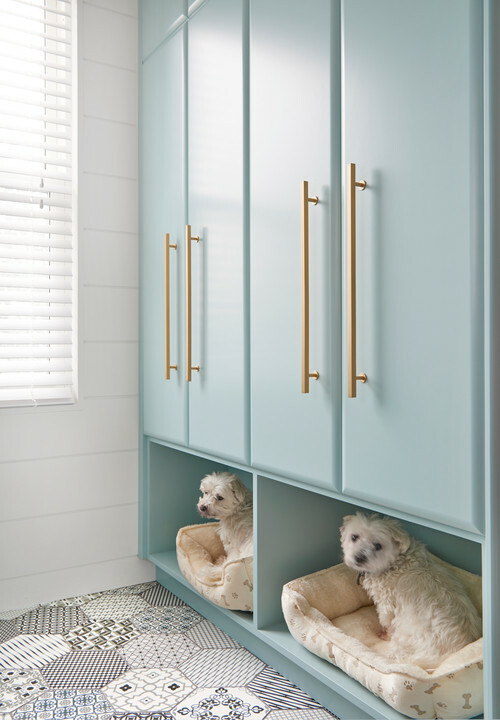 Don’t forget about pets too - if space allows, why not consider a dedicated place for storage of pet food, an open base cabinet for a discreet and comfortable pet bed and installing a dog bathing or showering area. In a modern world that embraces multi-tasking and for homes that are struggling to find sufficient floor space, it’s no surprise that many Aussie homeowners couple up their laundry with bathroom facilities. With some smart planning the laundry room needn’t look like it’s crammed full of things you need in both spaces. Sharing the wet area space of your home also makes getting the plumbing and ventilation a lot easier as you only need to worry about one location. Lighting plays a key role in shaping the overall appeal and the practicality of multipurpose spaces. 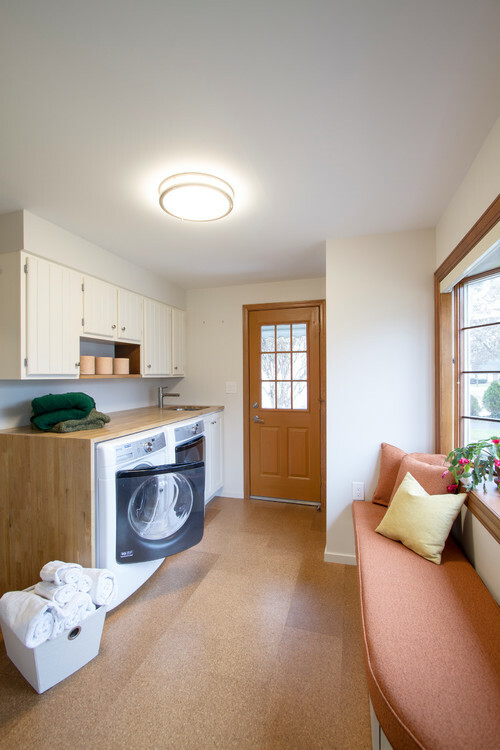 Ensure that there is a wonderful combination of task lighting and natural light so the dual purpose room is not only livable but also is a comfortable space to complete both laundry and bathroom tasks. Most laundries are home to everything from cleaning products, pet supplies and of course dirty washing, therefore having enough practical storage to cater for it all is crucial. A combination of cupboards, overheads and drawers will give your laundry the abundant storage that your house may be lacking. Opting for custom cabinetry can you give you more flexibility in the design of storage so you can have specific places to store items such as the ironing board, mop and vacuum cleaner and keep them out of sight when not in use. 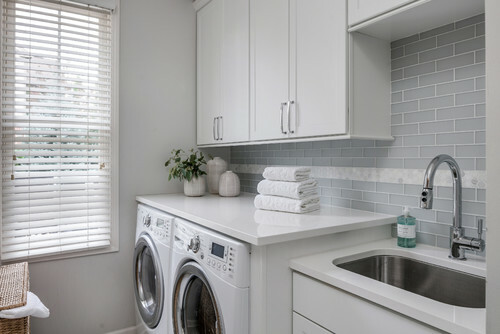 Open shelving options are also gaining popularity, with many homeowners looking to improve the aesthetics of their laundry rooms by displaying vases, candles and fresh towels. They are also highly practical too - installing an open rail to air clothes on hangers, reduces ironing and also frees up bench space. As one of the biggest danger zones in your home, the laundry needs to be planned so that it covers off on all safety risks. Few daily tasks require you to use more electricity, lift more weight, or deal with a wider variety of chemicals so it’s important to consider through the layout of the room how to minimise any potential hazards. This involves installing proper wiring and giving some thought to the locations of your outlets such as mounting higher on the wall so that it is easier to plug in appliances like irons. If you have small children, there are many practical benefits of overhead cabinetry not least of which being it provides a safe place to store harmful chemicals out of reach of little hands. Let’s face it - most of us don’t get excited about doing the laundry but a beautifully designed space can really lighten the load! It’s just those overlooked areas that can make your laundry room a whole lot more convenient and comfortable to be in. 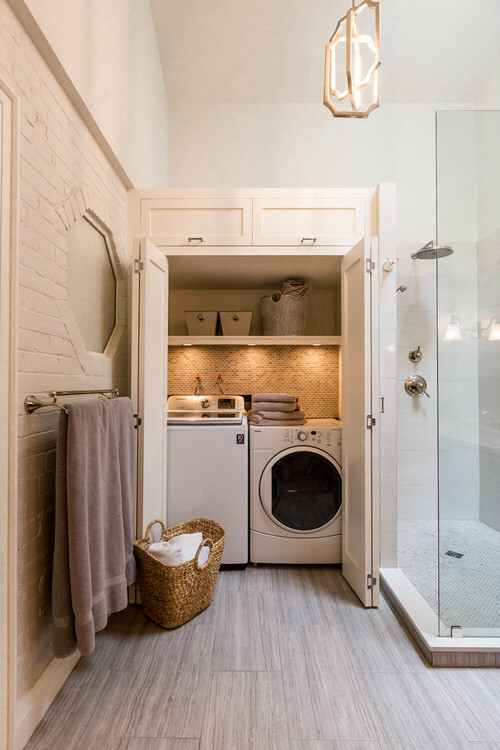 Some popular ideas include a built-in bench that stretches across a whole wall for the folding of laundry, installing an oversized sink that can handle some grit so you have the option of hand washing delicates and adding a glass door or skylight for more illumination and natural light. Finally, a stylish splashback using tiles of your choice can provide a stunning focal point for the room while a few lush plants or humorous sayings framed on the wall will keep the room from feeling too sterile.